Order mothers day flowers with delivery to any address in Riga and all over Latvia. ❶ Order mothers day flowers with delivery to any address in Riga and all over Latvia. Make happy your loved ones with a magnificent flower bouquet. To order mothers day flowers with delivery in Riga and all over Latvia the best floristic studio of the capital KROKUS offers. A wide selection of fantastic bouquets at competitive prices can be found in our product catalog. It is possible to send flowers mothers day directly home of the gifted. Own courier service will deliver the bouquet in perfect condition just in time. You can also order beautiful mothers day flowers by phone +371 200 303 06 at any time! In the modern calendar you can find a large number of festive dates, one of which is Mother's Day. On this wonderful holiday each of us wishes to surprise and please our mothers with sincere congratulations and a bright gift. That is why the online shop KROKUS is pleased to offer all its customers a wide range of flowers for the order in Mother's Day with flowers delivery to Riga and other Latvian cities. Now to find suitable flowers for mothers day is easy, and you can order them in just a few minutes! ● individual approach to each client. The catalog of goods of the company KROKUS presents a wide selection of arrangements that are ideal as a gift for Mother's Day. To find them, go to the section "What reason?" and select the category "Mother's Day". Here you will see beautiful mothers day flowers, which can be sent to Riga or another city of Latvia without leaving home. Bouquets of chic roses of different colours and sizes, Dutch and royal tulips, orchids, hydrangeas, chrysanthemums, irises, gerberas, camomiles and other garden and field plants are carefully collected by professional florists. Often, the arrangements are supplemented with decorative ornaments, stylish packaging, sweets, souvenirs, greeting cards. Be assured, you will not find this choice of mothers day flowers and gifts in any shop in Riga and all over Latvia. One of the strongest aspects of our company is a courier service. 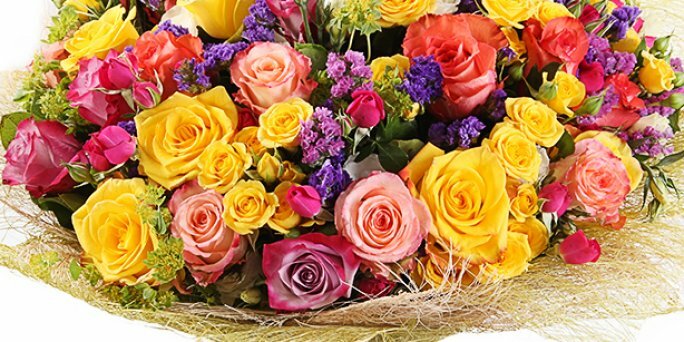 Among its services you should pay attention to the possibility of receiving a bouquet of same day mothers day flowers in Riga (Latvia) on the same day the order was issued. Thanks to the urgent delivery, many clients of the capital were able to congratulate their relatives in time, despite the fact that they accidentally forgot to buy a gift in advance. KROKUS offers the customers even a mothers day flowers same day delivery sunday at the address in Riga (Latvia), which distinguishes us from competitors. It is important to note that we receive all mothers day flowers for delivery in Riga and all over Latvia from reliable and trusted suppliers. This means that you get a quality bouquet from the freshest flowers on time and without any problems. You will find the best mothers day flowers riga in KROKUS catalog! How to send flowers mothers day in Riga (Latvia)? If you wish to order mothers day flowers online to the address in Riga or another city in Latvia, the optimal solution will be to contact the online shop KROKUS. Having issued an order 2-3 days before the event, you can save money for delivery services, because in this case KROKUS will bring flowers to Riga absolutely free of charge. To make a purchase of a bouquet, choose the desired arrangement in our catalog, indicate its desired size, complete the gift with a souvenir, postcard or sweets and go to the delivery registration page. Here you need to specify the contact information of the recipient, as well as the desired date and address for sending. After payment for the goods in one of the most convenient methods, all the work on the creation of a luxurious flower arrangement and its presentation to the gifted will be taken over by the specialists of KROKUS. And you can be sure that a loved person will receive an elegant bouquet of fresh flowers on time with your warmest wishes.